Aquaculture is the farming of aquatic animals or plants principally for food. It includes the breeding, rearing, and harvesting of fish, mollusks, crustaceans, and plants in fresh and saltwater environments. The practice originated in China about 4,000 years ago, and global production continues to be dominated by China and other Asian countries. Aquaculture is used to produce food by some of the poorest communities around the globe as well as by major corporations. Globally, aquaculture already supplies more than half of all seafood produced for human consumption, a statistic that continues to rise as the world population grows. According to the Food and Agricultural Organization (FAO), 3 million tons of fish were produced by aquaculture in the 1970s, a figure that spiked to nearly 77 million tons in 2015. More than 550 aquatic species are farmed. The top fish species include carp, catfish, salmon, and tilapia; commonly farmed shellfish include shrimp, oysters, clams, mussels, and scallops. 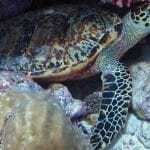 Newer to the marine aquaculture menu are various species of seaweed. Aquaculture also includes the production of fish for the aquarium trade and plants for the pharmaceutical, biotechnology (e.g., biofuels), and health industries. It is also used to replenish depleted fish stocks in the wild; the majority of “wild” Alaskan salmon come from hatcheries. 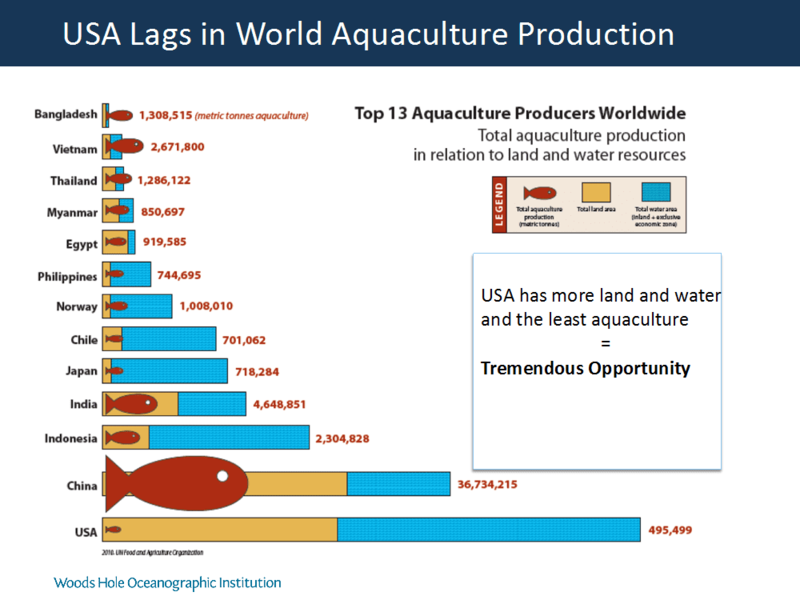 Who are the leaders in aquaculture production? While the United States is one of the world’s leading consumers of seafood, it only ranks 16th in total aquaculture production according to the FAO. Americans consume nearly 5 billion pounds of seafood annually, and over 90% comes from overseas. China is firmly at the top of the global aquaculture leaderboard, producing nearly 60% of farmed seafood. Other leaders include Indonesia, India, Vietnam, and Thailand. 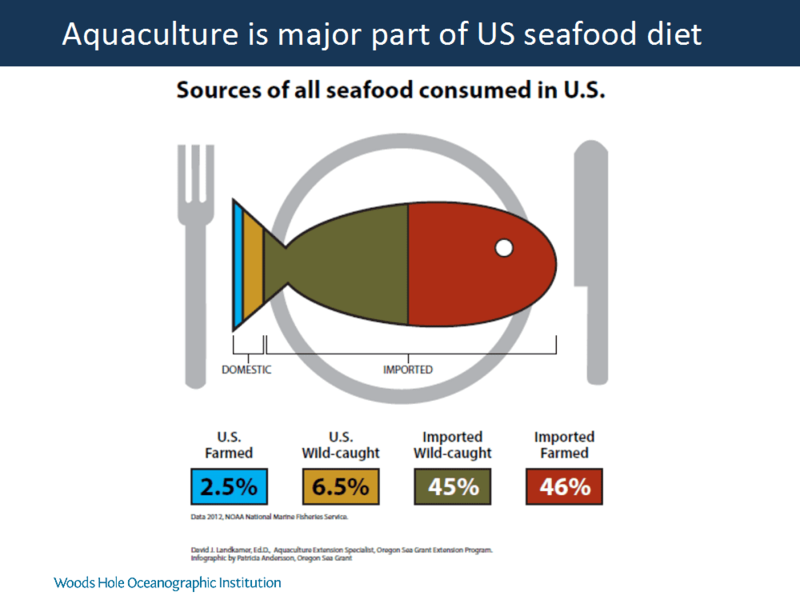 As the global demand for seafood continues to rise, the FAO, National Oceanic and Atmospheric Administration (NOAA), and other groups are outlining strategies to boost new U.S. aquaculture production. Some of the challenges in the U.S. thus far include regulatory and policy hurdles (e.g., the need to secure permits to farm in state and federal waters), as well as a reluctance by more established commercial and recreational interests to share the marine environment. What are the methods used in aquaculture production? Many different aquaculture technologies are in use around the world, each with its own pros and cons. Commonly used systems include open cages and coastal and freshwater ponds for finfish, and systems suspended from ropes and floats for shellfish and algae. Most finfish and shellfish culture involves hatcheries where eggs are hatched and raised to juvenile stages before they are transferred to a natural environment where they grow into adults. Marine fish like salmon are often farmed using open cage systems, which allow for the free exchange of water between the farm and the environment. In its brief 50-year history, marine fish farming encountered many early challenges from untested management practices and had to learn to cope with diseases, waste deposition, potential escapes and interactions with other marine life. Most of those challenges have been addressed by modern management methods and technologies (fallowing farm sites, vaccinations, better engineering) with major investments by corporations. Tilapia and shrimp are often farmed in ponds where water exchange is controlled. Normally, the waste discharged with effluent water is biologically treated before it enters the natural environment. 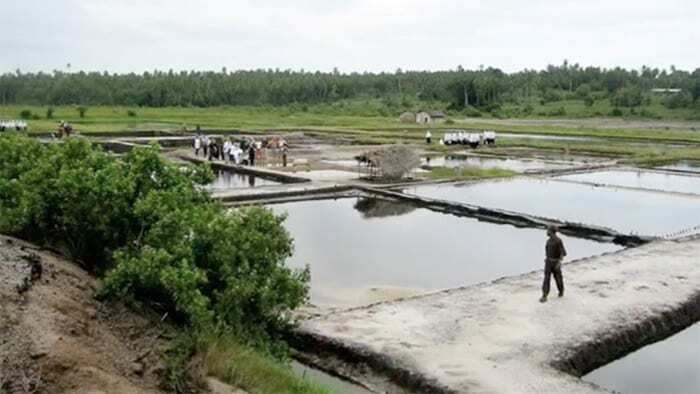 If not properly managed, pond culture can degrade downstream environments and contribute to the destruction of wetlands and mangroves. Systems that pose fewer risks to the surrounding environment include onshore recirculation systems that also treat and discharge relatively small volumes of the water to the environment. Fish farmed in this manner include salmon, Arctic char, and striped bass. Suspended or “longline” aquaculture systems—which can be located nearshore or offshore —are used to raise shellfish, which eat plankton that they filter out of the water and do not need additional inputs of food. These systems consist of tensioned and submerged horizontal ropes held in place by anchors and buoys from which shellfish (or seaweeds) are suspended by ropes, or sometimes in trays or mesh bags. Aquaculture is playing an increasingly important role for the planet as a food and potential energy source. As the most rapidly expanding sector of food production, aquaculture is one of the fastest, most resource-efficient ways to produce protein, according to NOAA. It has already helped improve nutrition and food security in many parts of the world where wild fish stocks have collapsed. Looking ahead, it could be the answer to a major food sustainability challenge. Scientists at WHOI estimate that, at a minimum, we need to increase food production by at least 50% over the next 30 years and by 100% in 2100 to sustain the projected global population. In those decades, land-based food production will be challenged by climate change and fresh water shortages in many regions. To preserve what natural terrestrial environment we have left, new food should come largely from the ocean, which covers more than 70% of Earth’s surface, yet currently supplies only 2% of our food. Aquaculture also holds great promise to meet the world’s growing energy needs. Demand for energy is increasing 1-2% per year, driven by a growing population and increasing economic development. About 90% of our energy presently comes from oil and gas, which are finite natural resources and contribute to climate change. Researchers have turned to biofuels—fuels generated by biological processes—as a potentially renewable source of energy that can in principle be carbon-neutral. Biofuels from land-based sources such as corn and sugarcane require arable land, fertilizers from fossil fuels and scarce fresh water, whereas biofuels from marine algae and seaweeds require only sunlight and abundant seawater. Given the potential for aquaculture to meet two critical human needs—food and energy—scientists are working with resource managers and companies to find safe ways to scale up production in the U.S. and globally. Key challenges in basic engineering and biology remain. These include developing the tools to operate and monitor large-scale aquaculture systems in ways that have the least impact on ocean ecosystems and people. What are the impacts of marine aquaculture on the environment? Whether on land or in water, all farming practices have some impact on the natural environment. As mentioned earlier, marine fish and shrimp farming can have negative effects if not carried out in an ecologically sound way. New farming practices of integrating shellfish and seaweed culture with fish farming can reduce impacts and enhance the environment. In fact, shellfish and seaweed farms provide valuable ecosystem services by accumulating excess nitrogen and carbon, and by providing structures in the water column that become nurseries for important fisheries. Aquaculture regulations vary from country to country. In the U.S., several federal and state agencies are involved in aquaculture regulations, and the permitting process for new facilities can be lengthy and complicated. The primary federal agencies charged with regulating aquaculture include the Food and Drug Administration (FDA), the Department of Agriculture (USDA), the Environmental Protection Agency (EPA), the Army Corps of Engineers (ACOE), and National Oceanic and Atmospheric Administration (NOAA). Each is responsible for a different aspect of aquaculture programs. For example, ACOE and NOAA issue permits authorizing aquaculture licenses, whereas EPA regulates wastewater discharge and the use of chemicals in aquaculture facilities. Although existing federal statutes provide a framework for regulation, critics say that none addresses aquaculture directly, and state regulations for different kinds of aquaculture facilities vary considerably. Critics also suggest that there is no way to ensure that regulations are uniformly enforced. What are scientists doing to advance sustainable aquaculture? There is a strong push to scale up aquaculture production in the U.S. and around the world, and to address the challenges of implementing and maintaining large-scale farms. For example, scientists are working on ways to mitigate the impacts of climate change on aquaculture farms. They are investigating the best location for future farms as climate change generates new circulation patters, warms coastal waters, and changes ocean water chemistry. 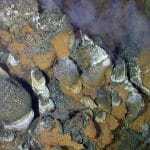 As carbon dioxide accumulates in the atmosphere, the ocean absorbs more carbon dioxide, leading to ocean acidification. Over time, this reduction in seawater pH dissolves the calcium carbonate shells of marine organisms such as oysters, mussels, and clams. WHOI scientists are investigating a strategy to mitigate this problem by adding a safe chemical buffer (e.g., sodium bicarbonate) to seawater to absorb the impact of acidification on the most sensitive early stages of shellfish in hatcheries. Another threat to shellfish farms comes from harmful algal blooms (HABs), such as red tides. Occasionally, certain species of algae that grow in the ocean burst into “blooms” that accumulate in visible patches near the surface of the water. A subset of these produce toxins that work their way up the food web and are consumed by shellfish. People who inadvertently eat the infected shellfish can suffer severe gastrointestinal impacts such as vomiting and stomach pain, paralysis, amnesia, and even death. Occasionally blooms stunt or kill the shellfish. In response, scientists are investigating ways to keep the coastlines clear of excess nutrients that can fuel algal blooms. 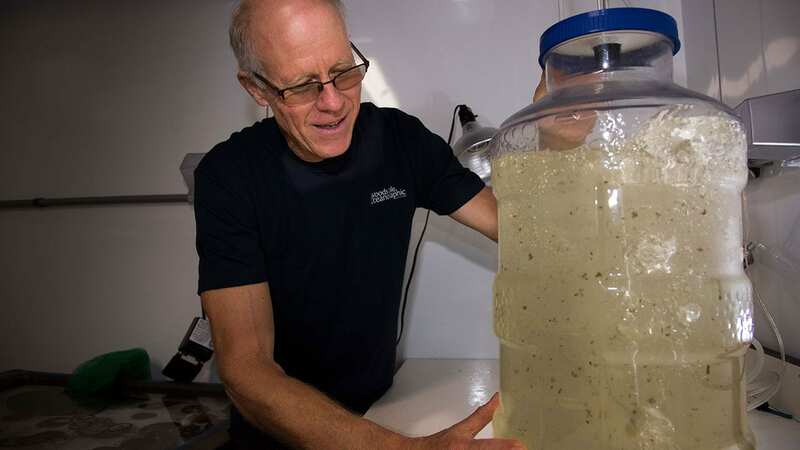 They are also investigating the use of new genetic tools to breed desirable traits into aquaculture species to make them more resistant to disease and climate change. There are many exciting projects underway to scale up aquaculture production. For example, one major challenge identified by the research community is the need to routinely monitor aquaculture farms—a difficult task if farms are located offshore. Scientists are developing new robotic vehicles to autonomously sample and monitor offshore aquaculture production. In addition, they are developing ways to farm species that are new to aquaculture, such a type of seaweed called sugar kelp. 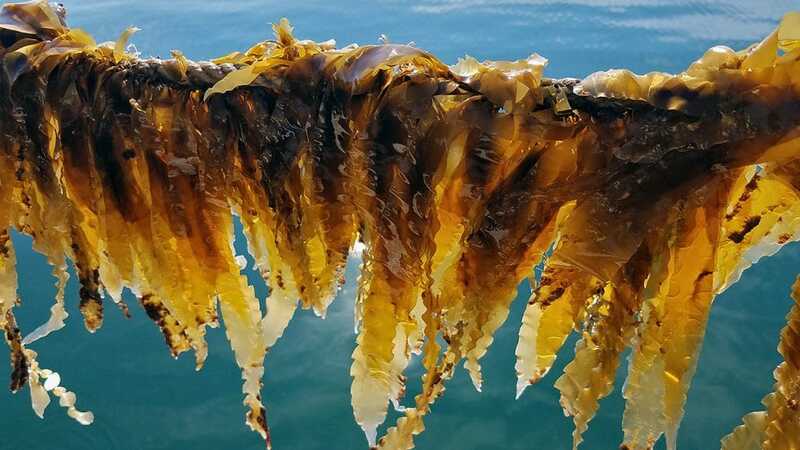 Sugar kelp may lend itself to large-scale offshore production because it only requires sunlight and clean ocean water to grow and has a relatively short growing season. Sugar kelp also holds tremendous promise as a future source of biofuel. New research shows a way to tap overlooked fats in marine algae to produce compounds used in jet fuel. Where Will We Get Our Seafood? Is Aquaculture the Solution to World Hunger?